If the name Martin C. Strong is familiar to you, it’s likely you are a serious music fan of some kind. It’s possible you’re even some sort of music geek. Strong is developing into the guy when it comes to encyclopedic books about various bra nches of music. Thus far he has authored or been part of The Great Rock Discography, The Essential Rock Discography, The Great Metal Discography, The Great Psychedelic, The Great Alternative and Lights, Camera, Soundtracks. 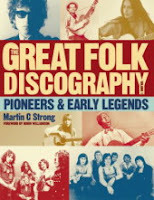 To all of this he now adds the first volume of The Great Folk Discography, which focuses on Pioneers and Early Legends. Volume Two: The New Legends, is due out in December of this year. Long story short: the music lover in your life might be very happy come Christmas.